The 74F245 is an octal transceiver featuring non-inverting 3-State bus compatible outputs in both transmit and receive directions. The B port outputs are capable of sinking 64mA and sourcing 15mA, producing very good capacitive drive characteristics. The device features an Output Enable (OE) input for easy cascading and Transmit/Receive (T/R) input for direction control. The 3-State outputs, B0,B7, have been designed to prevent output bus loading if the power is removed from the device. 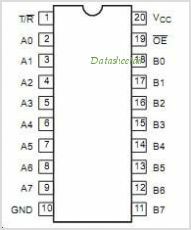 This is one package pinout of 74F245,If you need more pinouts please download 74F245's pdf datasheet. 74F245 circuits will be updated soon..., now you can download the pdf datasheet to check the circuits!